I found a gargoyle at the door of the old school house in Pirton churchyard near Shillington. I suspect it’s not an original, more likely a reproduction set in concrete. Gargoyles put me in mind of the church building over the road from my school where the nuns held art classes. My older sister, artistically gifted, at least compared to me came home one day with a gargoyle she had drawn in charcoal. It filled an entire page of her sketchbook. ‘It’s so ugly,’ I said. My sister held her head high. ‘So ugly as to be pleasing.’ This is not an attitude my sister typically adopted, an appreciation of beauty within the obscene. For to me the gargoyle was obscene, ugly enough to want to turn my eyes away. I have since heard that gargoyles serve the purpose of protecting the inner sanctum of a church from attack. These hideous figures with big noses and warty chins, with bulbous lips and flapping ears, which stick out their tongues at passers by, do so to keep trespassers away, and to protect. Beauty and the beast. I likened that story to my mother and my father, my mother the beauty, my father the beast. The story of the monstrous ugly beast who lived alone high in a castle and who despite his appalling visage managed in time to attract the love of a young girl, repelled me from my earliest days, repelled and enthralled me. 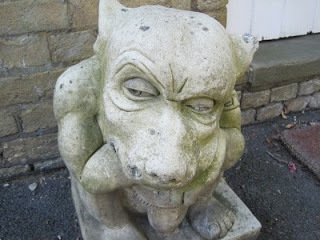 Like the gargoyle at the door of the Pirton school house, like the business of travel itself. When we drove our car through the Dingle Peninsula in the County of Kerry past the famine houses and stopped to explore the places where so many starving peasants once lived during the potato blight of the 1800s, I refused to let myself be swallowed up by the landscape. It is a forbidding landscape, bare green hills pockmarked with rocks, bashed by salty gusts from the sea. Everywhere I looked I saw only green, the white of the waves and the grey blue of the sea. I could not bear to live in such a place I thought to myself, for even at the height of summer it was cold, a cruel cold that ate through my clothes, thin as they were because I had dressed for summer, even though so many people had advised me, ‘when you go to Ireland, you need warm clothes’. Inside the car the English voice on the GPS directed us through the winding narrow roads on the peninsula. We passed one parked tourist bus after another and were relieved to notice that we travelled in roughly the same direction. Imagine having to share the narrow roads with such bulky vehicles. Clearly people do so regularly. Such an unforgiving landscape and yet in terms of landscape it was the highlight of my trip, perhaps because I could attach it to a story with resonances of a cruel past. We visited James Joyce’s Tower in a place called Sandy Cove and I tried to sense the ambiance of Ulysses. We ate a sandwich in a nearby cafe, and I could not feel the spirit of the author, too many layers of life have been superimposed onto his territory. We cannot judge the past by present standards I keep telling myself and yet the impulse is there as ever. I heard our new prime minister, Julia Gillard, announce on the radio yesterday the date for the next election and with it she offered a short speech that I felt went on too long promoting her party, the Labour part ahead of the rest, primarily the other major party in Australia the Liberal party. I’ll keep this simple; suffice to say she emphasized the need to keep Australia moving, an expression that is fast becoming a joke. The image of an actual physical land mass move comes to mind. Push the country further towards Indonesia or towards the Antarctic, towards new Zealand perhaps, north south east or west. To make this move, which she clearly intends metaphorically we need determination, resolve, optimism, I cannot remember her exact words, but it struck me that she left out the word ‘doubt’. There is no room for doubt in a politician’s rhetoric. I prefer a bit of doubt myself. In fact I prefer a fair whack of doubt in most things – doubt, uncertainty and yet we must speak with confidence and certainty. And even when we write our maybe, perhaps, our equivocations on the page, people still tend to read our statements as those of fact. Forgive me. I’m off onto the track of abstractions and I hate this way of talking, of writing. Give me an image any day. I love gargoyles, and that picture you've got up there is a great one. I am fond of gargoils myself. Good job connecting all the threads. I am envious of your trip, I have not been to Ireland or Australia yet. Someday! Gargoyles. I don´t know where lies the limit between what is supposed to be beauty and what is ugly. I think it all depends in our own experiences. For me what is poor and miserable is ugly, but not because of its aesthetics, but for what it impplies. Maybe that is why i have a photographic obsession with what is grothesque and decadent, an obsession for trying to find out if it is possible to extract anything positive from it. That have led me to refine my eye and realize that what matters is not at sight, but behinds masks and disguises. Anyway. I fully agree with that you mention on Joyce. Yes, we can do a serious effort on trying to recreate a certain athmosphere, but it will be impossible, what we are doing is nothing but projecting our own vision of the world, on the other hand, that is what is exciting about literature, that a couple of lines can prompt us not only to imagine a certain moment, but can even help us in creating a personal world. Doubt and determination are for the wise, hesitation and boldness for the rest. We have a similar thing in front of my former elementary school, but it is just 2 normal lions as far as I remember. I always found gargoyles to be a rather pagan(ish) thing to include on such stern and imposing Christian buildings and hinting at a huge degree of superstition. I'm tired already of the election campaign, of 'real action' espoused by Tony Abbott (presumably instead of 'fake action' or 'real inaction') and of Julia's drone about moving forward. I think you'd have had more chance of connecting with the spirit of Joyce in Paris, Elisabeth. Like his pal, Beckett, the most famous Irishmen who didn't live there! Love the ant dance way you connected your recollections. The part of Ireland you describe holds a special place in my heart. I didn’t feel Beckett when I was in Dublin either. I looked for him before Joyce. I went to Trinity College and sat in the courtyard. On the way out there were some lads playing cricket. I expect Beckett played there – he was a talented cricketer, could probably have made a living at it – but once you’ve seen one game of cricket (or even ten minutes of a game of cricket) you’ve seen them all. Perhaps that’s where the first germ of Godot appeared. As for gargoyles I find myself without much of an opinion. They neither repulse me nor excite me. I guess I’ve never been one for wandering around old churches and I’ve only been in a handful in my life, that last two times to see plays – Waiting for Godot and Hamlet if I remember correctly. I know the architecture is an impressive achievement but it does nothing for me. The god of the Bible used to live in a tent for goodness sake. I always assumed that Gargoyles were placed on cathedrals to illustrate to medieval illiterate masses that all that "evil" was outside and the goodness of the church lay inside. Perhaps a metaphor I am imposing on my own. Perhaps a form of medieval advertising. Who knows? Doubt, huh? Not a bad word to have in a title of a blog. I never understood why gargoyles were on the side of some older churches until you explained it just now. You'd think God-fearing people would be to scared to go into the church with those things looking out at you. I've noticed that otherwise secular buildings built in the late 19th-early 20th century often have angels on the outside. These buildings often tend to be financial institutions. I've always liked gargoyles. Besides scaring away Evil, they typically serve(d) a utilitarian purpose: diverting rainwater flowing off rooftops away from the masonry walls…or functioning as a handy conduit for pouring sewage or boiling oil on invaders. Those medieval Europeans were a creative lot, yes? I always look at the gargoyles perched atop cathedral walls or castle towers. Some are truly fearsome. Some are daft or crazy insane. Gargolyles aren't boring. I rather like Gargoyles and have to put mine back up now that the painters have finished. I also have a Kitchen god in my home, a Temple Guardian on my outside wall and Noah Bells tied to my gates. All to help with protecting my home bringing good fortune and scaring away evil spirits and or x husbands …. I figure it can't hurt and I like the way they look. Elisabeth, you've given me many images here in this post. And I'm intrigued by all them, only wishing that I could sit across from you and really talk. Angryparnsip and you have inspired me to make or get some gargoyles for my home. Ugly beauty. Great post. People that are skeptical and have doubts usually are more open to everything, infinitely curious and searching. Truly the most delightful people to be around. The lacy ugly beauty dance, indeed it is. Thanks Steven. I'm glad you like the picture, Sco Man. You may have noticed I'm not one for photos, this one I took myself on my little point and shoot camera. It's not too bad, even my photographically inclined husband concedes. Thanks, ScoMan. Thanks too, Kat. I hope you make it to Australia and Ireland one day. I'm sure you'll be impressed. I enjoy your blog very much for your appreciation of the beauty that lies beneath, Alberto. Where we least expect it. And also I admire your ability to transfer that sense of the beautiful under the ugly mask into a photographic image that becomes an art work. Thanks, Alberto for your kind and wise words. Lions don't affect me in quite the same way as Gargoyles. But you're right I think, Ropi. They serve a similar purpose. Though I expect lions are meant to intimidate by virtue of their esteemed brute force whereas gargoyles are more likely to shock us into submission. Gargoyles go quite well with the election campaign, Kath. And judging by the front page of 'The Age' newspaper in Melbourne this morning, photographs of badly positioned babies can be thrown in as well, for shock effect. Thanks, Kath. Thanks, Rachel. I'm glad you find my musings akin to following an ant. Every city wants to lay claim to its famous creative ghosts – the writers and the painters. It enhances nostalgia and the tourism I expect. 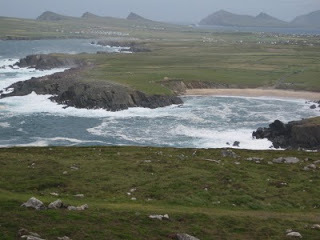 I wonder what is it that the special place in your heart holds for the Dingle Peninsula, Zuzana. No need to tell. On my way home on the plane, I watched a movie that was set in part along the Dingle peninsula, but I can't even remember the title of the film. That's what comes of watching too many movies in flight. Jim, I can just imagine you sitting at that cricket pitch at Trinity in Dublin waiting for the spirit of Beckett to rise up from the ground and the click of the ball and bats and into your soul. Your godless soul, given your views on churches, the practice not the architecture. I appreciate your appreciation of the merits of doubt. You're a man after my own heart in this regard. Well Robert, as ever the skeptic, What an interesting thought, that the gargoyles represent the evil outside the church or cathedral as opposed to the inner good. There may be some truth there. I don't know what the medieval architects had in mind, but this conjecture is as good as any. It makes sense to support the financial institutions with the wings of angels and their swords, Kirk, as much as it makes sense to protect the churches with the ugliness of gargoyles. There's another film that comes to my mind, Jonas, now when I read your comment on the value of Gargoyles as rain water spouts. In the film Cafe Paradiso, as I recall our young protagonist pisses from the rooftops of the church and someone below imagines it's raining despite the sunshine. You're right, Jonas. Gargoyles beat aluminum rain spouts any day. Thanks. We're fairly multicultural here in our home, too Parsnip. We have a couple of small gargolyes out back on plaques against the walls. They are busy picking their noses. Plus we have various examples of Ganeshas and Indian goddesses and even the occasional christian icon from my childhood, alongside the wind chime from Byron Bay. It might seem a tad irreligious but to me it's all crazily beautiful. Thanks, Elizabeth, my namesake, but spelt with a 'z'. It would be good to talk in person. You never know, one day, maybe. In the meantime, thanks for your thoughts here. I'm glad my thoughts and images resonated for you. Kass, you might be able to write a poem about the juxtaposition of ugliness and beauty, alongside one that includes the conflict between doubt and certainty. I'm all for doubt! Thank you. I like the sort of writing that goes off at a tangent – it's the brain in script. I found the Irish countryside quite unappealing. We lived there for two years. It was the abandoned cottages that depressed me as though something would decay and it was easier to move on and build something new. Maybe it was! 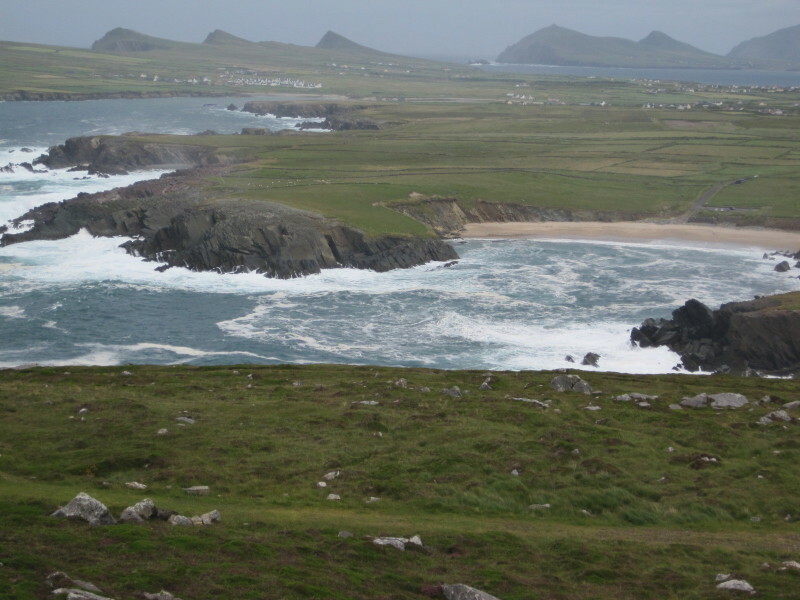 fourth – Dingle. I was there about 8 years ago and it was the most memorable part of my Irish experience. It was November, cold and miserable with no tourists. The only signs of life were a funeral procession at 8pm crawling past the pub in the dark and later some great music in the same pub. We stayed one night in the hostel (former castle) on the outskirts and though i'm not one to believe in ghosts it was the closest I've ever come to the supernatural. We left the mext morning for a B&B in the village. Finally 'doubt'. I am a big advocate of doubt (partly self-serving as that is my natural state) but I believe (ironically with little doubt) that uncertainty leaves one open to other possibilities and creates space for other people's ideas. Sorry this is so long but I'm quite excited to find this link in blogland which feels like it might lead me somewhere. it's always such a pleasure to read your words and take a trip to different, interesting places. Your words do that to me. They make me travel in my mind. I've never been in England or Ireland, but i hope one day….. I have very strong feelings of connection with England somehow. I think i would love the rough landscapes of Ireland. Wuthering height feelings or something like that. Doubt is a good start. i love your way of writing, for taking me on a wonderful journey. The beauty and the beast within all three. No-one should be able to write so well, say so much and then apologise for it! Thanks Elisabeth. I love assignments. I'll give that one some thought. There is a theme here, which you've pointed out in reverse order – doubt, barren landscapes and ugly gargoyles. I hope you're well. I must check out your blog. I've been remiss, too busy, trying to work on my neglected thesis but you're in my mind. Don't worry about the length of comments here, Steve of Little Hat. I love them. It suggests the possibility of a conversation. It's wonderful that we have all those connections on the basis of this one post. The most important seems to me to be the business of storytelling for fringe dwellers like us. You lived in Ireland for two years Janice, near those decaying cottages. Amazing. That must have been tough, especially in the winter. I thought it sad that the famine cottages seem so neglected. The National Trust might have something to say for the importance of preservation but these things often come too late. And sometimes the relics from the past just have to disappear. We can't keep mementos of everything, though it's still very sad, as if the decaying cottages in themselves represent the lives that were probably lived in them – neglected and forgotten. Yes Momo, I can see your love of gargoyles in your work and your fascination with Wuthering Heights-type landscape. It resonates through your blog on grave yards and eath. Thanks for your kind words here. My daughter loved your poem, AJ Ponder. And imagines she could get herself checked out for coelics, but she has no symptoms and therefore probably won't bother. Thanks for your kind words, here. Well, Kass, I now await the completed assignment. Please let me know when it's to hand in case I miss it. I stayed in London's Bloomsbury last autumn and lurked around the homes of such luminaries as Charles Dickens, Bertrand Russell, Virginia Woolf and about a squillion others: didn't feel the spirit of any of them. I have stayed in Ted Hughes' house and perched on Sylvia Plath's grave: nothing. I suspect I don't have the necessary imagination. I like your abstractions, they make me work the concrete mixer. Today it is so warm here in Scotland I am almost tempted to take off my jumper! How disarming and attractive it would be if a politician did in fact express doubt, concern, true emapthy….I bet they can in their private lives … do they not get that as Australians we would find such honesty compelling?! I have always been fascinated by gargoyles, maybe because their ugliness is pleasing in that it helps them serve their purpose. I always thought true ugliness was being helpless and useless and not knowing what to do with one's own power. For this reason, I have never seen gargoyles as ugly. So warm in Scotland as to think to take off your jumper, Eryl. That must make it warm. That's what surprised me in England and more so in Ireland, that people swam in the ocean when it was not even warm enough for me to take off my cardigan. Thanks for your thoughts, Eryl. There's a lot to subjectivity and imagination. Some of us can feel the presence of ghosts, others not. Empathy and political life do not seem to connect, Mary. It seems sad but I expect people have to be thick skinned to survive in that world of politics and to survive there one has to have thick skin and a thick skin does not equate with empathy and compassion. Thanks, Mary. You have a more symbolic view of ugliness it seems Phoenix to do with states of mind and powerless. Very true. There is something ugly about slavery and war, for instance. Compared to these gargoyles are positively charming. Thanks, Phoenix. I also have Irish ancestry that I know almost nothing about. I'd like to rectify that if only a little someday. First of all thank you for your kind comment on my craft blog. It's so nice to know a fellow blogger! And through Barry it's even better…what a wonderful man he was! You're right. That is my photo on my header about 4 years ago. I tried to make it a little smaller but I never figured how to do that. I'm sorry about my english, it's a bit poor, but I'm trying to learn more and more so I think I'm going to read your blog as a learning process. I've a translator on the left side of my blog but I think it's awful. However I've not yet found another one, so it's all I have to offer right now. To find the sense of what was, hidden beneath too much modern trappings, requires surrendering to an altered state. Time travel, perhaps my most favorite theme, the ability to see our surroundings as they were, to feel what an admired author experienced, is easily hindered. I've looked for the vapor trails of such writers, not the plaques that tell us what happened where. I think it is one of the magical processes, becoming removed for all reminders of the present, and being carried away. Irish ancestry, Anvilcloud, it's worth looking into, for all those wonderful Irish associations, not least being the leprechauns. Thanks. Paula, it's lovely to see you here. Your English is wonderful, as is your blog picture. I, too, find it difficult to work out the logistics of photos, hence the limited number of images on my blog. Marylinn, I'd love to be able to time travel more. I am far too much earth based and land locked to travel far, but I too love being able to imagine those 'vapour trails' from our predecessors. Thanks. Sometimes, I think, anything said by a politician is just an expression of their doubt. But politicians, Mike, are bound to avoid acknowledging their doubts. It seems to me, if politicians could speak more openly about their uncertainty the world might be a better place. The trouble is people want their politicians to be like the Pope – infallible.